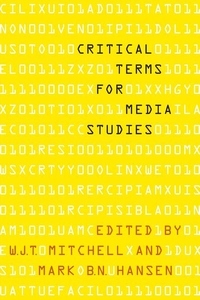 Part of a larger conversation that engages culture, technology, and politics, this exciting collection of essays explores our most critical language for dealing with the qualities and modes of contemporary media. Edited by two outstanding scholars in the field, W. J. T. Mitchell and Mark B. N. Hansen, the volume features works by a team of distinguished contributors. These essays, commissioned expressly for this volume, are organized into three interrelated groups: "Aesthetics" engages with terms that describe sensory experiences and judgments, "Technology" offers entry into a broad array of technological concepts, and "Society" opens up language describing the systems that allow a medium to function. A compelling reference work for the twenty-first century and the media that form our experience within it, Critical Terms for Media Studies will engage and deepen any reader's knowledge of one of our most important new fields.